Can anyone suggest any good railway books to buy? I have my name at a good bookshop in Tunbridge Wells waiting for a Nine Elms shed book to come in. I have 3 that my Mother In Law has bought me today for Christmas (And i chose them) and a good selection of books there were too. they took up a whole back wall pretty much of books. Would cetainly be good to hear. A lot depends on what you personally like to read. I'm slowly collecting all books that I can find on Oliver Bulleid and his loco's but I am aware that this is not everyones cup of tea, I also like reading books by former railwaymen. 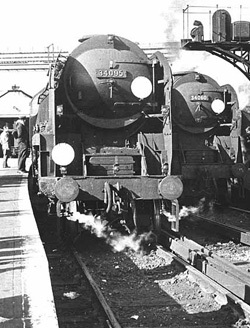 Roger Mannion's books on the Bulleid Pacifics, Duchesses and A4's are well worth a read, as are both Bert Hookers books. This is a book i shall be purchasing as it looks to be a very good read. Has anybody else purchased this book and if so; what do they think of it?